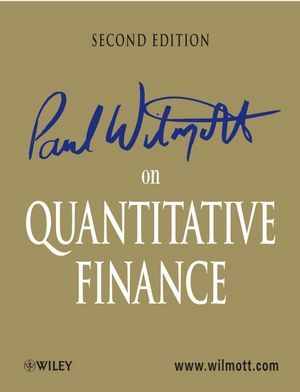 Paul Wilmott on Quantitative Finance, Second Edition provides a thoroughly updated look at derivatives and financial engineering, published in three volumes with additional CD-ROM. Volume 1: Mathematical and Financial Foundations; Basic Theory of Derivatives; Risk and Return. The reader is introduced to the fundamental mathematical tools and financial concepts needed to understand quantitative finance, portfolio management and derivatives. Parallels are drawn between the respectable world of investing and the not-so-respectable world of gambling. In this volume the reader sees further applications of stochastic mathematics to new financial problems and different markets. Volume 3: Advanced Topics; Numerical Methods and Programs. In this volume the reader enters territory rarely seen in textbooks, the cutting-edge research. Numerical methods are also introduced so that the models can now all be accurately and quickly solved. Throughout the volumes, the author has included numerous Bloomberg screen dumps to illustrate in real terms the points he raises, together with essential Visual Basic code, spreadsheet explanations of the models, the reproduction of term sheets and option classification tables. In addition to the practical orientation of the book the author himself also appears throughout the book—in cartoon form, readers will be relieved to hear—to personally highlight and explain the key sections and issues discussed. Paul Wilmott is a researcher, consultant and lecturer in quantitative finance in London, UK. He is founder of Wilmott Associates, a financial consultancy and training firm, from which he publishes Wilmott magazine. The Financial Times called him a "cult derivatives lecturer." He is one of the world's leading experts on quantitative finance and derivatives and is renowned for his criticism of popular models and concepts and for his unique, informal writing style. 3. The Random Behavior of Assets. 7. The Black-Scholes Formulae and the ‘Greeks’. 8. Simple Generalizations of the Black-Scholes World. 9. Early Exercise and American Options. 10. Probability Density Functions and First Exit Times. 12. How to Delta Hedge. 13. Fixed-income Products and Analysis: Yield, Duration and Convexity. 16. How Accurate is the Normal Approximation? 17. Investment Lessons from Blackjack and Gambling. 22. An Introduction to Exotic and Path-dependent Options. 27. Derivatives and Stochastic Control. 29. Equity and FX Term Sheets. 30. One-factor Interest Rate Modeling. 35. Multi-factor Interest Rate Modeling. 36. Empirical Behavior of the Spot Interest Rate. 37. The Heath, Jarrow & Morton and Brace, Gatarek & Musiela Models. 38. Fixed Income Term Sheets. 39. Value of the Firm and the Risk of Default. 46. Defects in the Black-Scholes Model. 49. Overview of Volatility Modeling. 50. Volatility Smiles and Surfaces. 53. Empirical Analysis of Volatility. 54. Stochastic Volatility and Mean-variance Analysis. 55. Asymptotic Analysis of Volatility. 56. Volatility Case Study: The Cliquet Option. 61. The Feedback Effect of Hedging in Illiquid Markets. 63. More About American Options and Related Matters. 65. Serial Autocorrelation in Returns. 66. Asset Allocation in Continuous Time. 67. Asset Allocation Under Threat Of A Crash. 68. Interest-rate Modeling Without Probabilities. 69. Pricing and Optimal Hedging of Derivatives, the Non-probabilistic Model Cont'd. 70. Extensions to the Non-probabilistic Interest-rate Model. 74. Life Settlements and Viaticals. 76. Overview of Numerical Methods. 77. Finite-difference Methods for One-factor Models. 78. Further Finite-difference Methods for One-factor Models. 79. Finite-difference Methods for Two-factor Models. 80. Monte Carlo Simulation and Related Methods. 81. Numerical Integration and Simulation Methods. A. All the Math You Need… and No More (An Executive Summary).